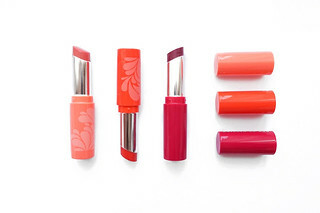 If you look inside my everyday makeup bag you'll find what I like to call my 'Holy Trinity' of bases. The three bases cover me for any type of skin day and whether I'm having a terrible breakout or enjoying one of those rare but wonderful clear skin days I know my trio, either individually or combined, can tackle any skin situation. Until fairly recently the members of my Holy Trinity were as follows: bareMinerals Complexion Rescue (reviewed here) for those good skin days, Bourjois Healthy Mix Foundation as a heavier base and my 'can-cover-anything' base: bareMinerals Original foundation. I'm telling you all this because something I never thought would happen has happened... the oldest member of my trio (a member for 7 years in fact!) 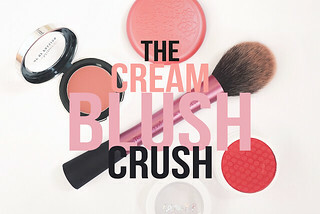 has been replaced by bareMineral's new Blemish Remedy Foundation*. And that's one hell of a big deal! The new Blemish Remedy foundation has in fact replaced my bareMinerals Original foundation, the base I've repurchased more times than any other makeup product I've ever owned. As my skin has slowly been getting more oily over the past few years I've found the lovely glowing finish of the Original foundation has started to border on shiny after 4 to 5 hours wear. And as I'm not the biggest fan of a matte finish I've never made the switch to their Matte foundation. The reason I adore Blemish Remedy so much is that it applies and wears as beautifully as the original but the finish is absolutely perfect for my combination/oily skin. It glows from within, with an almost velvet finish, and it also helps battle any pesky blemishes in the process. And that new packaging... I cannot wait to talk to you about the new design! 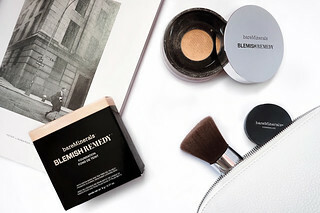 For me, the new Blemish Remedy foundation gets an A* for application, wear-time and finish. In a similar way to the Original foundation the coverage is build-able, you can apply a light dusting across your face to even out your complexion or apply with a heavier hand to reach full coverage. The thing I adore about bareMinerals's Mineral Foundation line is that you can apply extra coverage to just the problem areas of your skin without your base looking uneven and it never has a cakey finish. Since I've now been gifted with oily skin, I find Blemish Remedy has a longer staying power than the Original for my skin type. One of Blemish Remedy's major selling points is its ability to reduce skin oil and in a survey of 102 women, 100% of them experienced this reduction. By comparing the two BM foundations directly I also witnessed this difference and instead of blotting at the 4 hour stage I felt that I didn't really need to blot at all throughout the working day! My skin had a lovely finish to it too, leaning slightly towards the matte side but with a hint of that glow the Original formula gives you. Of course I can't talk about the Blemish Remedy foundation without discussing its blemish fighting properties. The added ingredients of Aspen Bark and Tea Tree Oil help tackle any pesky spots and even though this doesn't magically make spots disappear by the end of the day I definitely noticed a reduction in redness and it helps to soothe and calm those angry looking spots. You can certainly smell the Tea Tree Oil in Blemish Remedy (as soon as I opened it up I was hit with the smell which is actually quite refreshing!) but if you're not a fan of scented products don't worry, the smell doesn't linger when applied to the skin. I've actually been testing this foundation since August and it has performed wonderfully in so many different situations. I've worn this in the heat, during some of my biggest breakouts and when I've had clear skin and I honestly can't find any fault with this. When I initially tried this throughout August I hardly had any blemishes all month and I was worried that the Aspen Bark and Tea Tree Oil would eventually dry my skin out if I wore it on a regular basis. Yet, my skin remained hydrated and healthy and I even noticed a reduction in the pores around my nose. BareMinerals have added Aloe to help soothe the blemishes but this special ingredient also helps keep the skin hydrated so there's no need to worry about dry, flaky skin which I find occurs with so many blemish fighting products! Blemish Remedy is available in 10 shades, ranging from 01 Clearly Porcelain (which is the shade I own) to 10 Clearly Almond. The range is significantly smaller than the Original formulation which offers 20 shades so I definitely recommend popping to a bareMinerals counter to get colour matched even if you're already a long time wearer of bareMinerals foundations. Hopefully they'll add more shades soon! For reference, Clearly Porcelain is slightly lighter than my usual Original shade (I think I could also wear 02 Clearly Pearl but as this was a Press Sample I didn't swatch them side by side) but it suits me perfectly for this time of year. I usually wear Fairly Light in the Original foundation, Vanilla in Complexion Rescue and Light 1 in the Correcting Concealer! I cannot express how much I adore the packaging for Blemish Remedy! If you're one on those people who always forgets to twist the sifter back before popping the lid back on the Original foundation then the new design will literally change your life (you don't want to know how many times I've done this and found myself covered in foundation over the years!) And if you're not forgetful like I am... well the new packaging is simply much more of a pleasure to use. The design itself is sleeker and it feels much more luxurious and the new mesh device is really clever! I've found myself using less product because of it and much less foundation tends to escape onto my bathroom floor. The product is only released when you apply pressure to the mesh and you simply press your buffing brush down onto the mesh circle and the product is transferred directly into the brush. Then you just tap off any excess before applying to the skin. Wearing bareMinerals Blemish Remedy in Clearly Porcelain* with Rimmel's Stay Matte Translucent Powder on top. Blemish Remedy contains 6g of foundation and retails for £26.00 (the same price as the Original!) If you haven't guessed already I adore this foundation and if you're a fan of mineral products or suffering from oily skin then I'm sure you'll love this just as much as I do! I'm ridiculously excited for the rest of the range to make its way over from America too, I've already been having a snoop around Sephora! How do you feel about Mineral Foundation? Would you be tempted to try bareMinerals's newest base? * This post contains a Press Sample but as you probably all know by now all the enthusiasm, swooning and love for bareMinerals is completely my own! The first thing I gravitate towards when I step into Lush has always been, and will always continue to be, their bath bombs. In my most recent Lush Haul you might have seen that I managed to have some form of self-control and I only picked up 2 bath bombs: Twilight, an old favourite of mine, and one of Lush's newer releases and the focus of this review - Intergalactic. Retailing at £3.95 per bath bomb Intergalactic promises to transform your bath water into the Milky Way and transport you across the galaxy. The colour of this bomb is what initially caught my eye in the store and the vivd blue, yellow and fluorescent pink elements of Intergalactic create the prettiest swirling patterns as it explodes. And, to the delight of the inner child within me, it also features a serious amount of golden glitter and it even has popping candy! To say I was excited to use this is definitely an understatement. Ingredient-wise, Intergalactic's most dominant scent definitely stems from the Peppermint Oil. I'm not the biggest fan of minty scents but I have to admit I enjoyed this much more than I was expecting. The scent of peppermint wasn't as sharp as a lot of mint scented products I've used and I think that has something to do with the added Grapefruit Oil which offers something a little bit more refreshing to the overall scent of Intergalactic. At the same time, the scent of this bath bomb somehow manages to soothe and relax you whilst you're in the tub (thanks to Vetivert Oil & Cedarwood Oil) and it subtly lingers on the skin after you've hopped out of the bath. Getting yourself noticed is becoming increasingly harder. Whether it's in the blogging world or just generally in working life making yourself stand out and resonate in somebody's mind is such a challenging task. I've stumbled across so many amazing blogs in my years who hardly have any followers and I used to always wonder why. But promoting yourself, tweeting like your life depends on it and just being very present at all times really is the key to gaining a bigger audience. I was recently contacted by Solopress and asked if I would like to take part in their Get Noticed competition. The prize is really special and the winner will get to design and create their very own billboard and place it in a city of their choice! You can use this billboard to promote yourself in any way, whether it's some kind of visual CV or a way to promote yourself as a blogger and gain more followers. To get me started, Solopress kindly sent me this adorable personalised kit and allowed me to create my very own business cards! I'm so happy with how they turned out and now I won't feel like a numpty when I'm at blogger events and everyone else is exchanging business cards. To carry my business cards they sent me this adorable leather card holder with my initials on it and I also have my own personalised pencils - how cool is that? !